It’s time to deepen your magic and explore your mystic curiosity. To connect with your intuition, your highest truth, and your divine purpose. 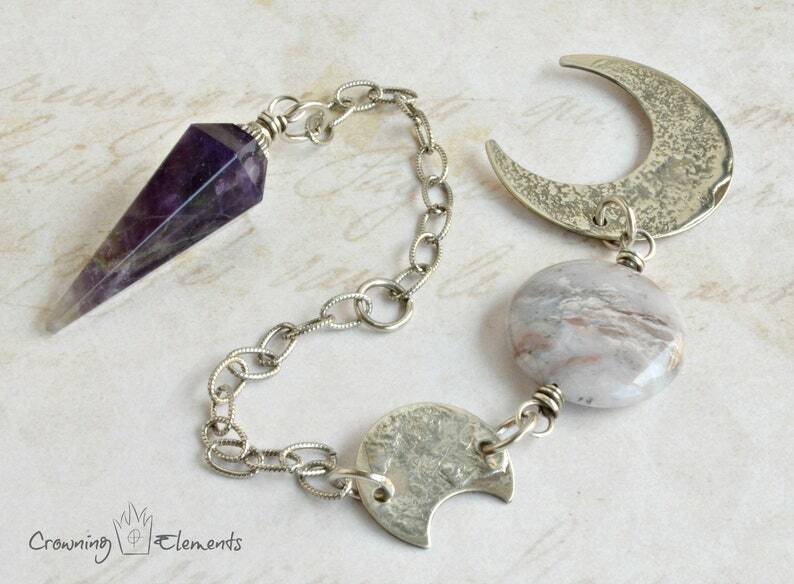 My one-of-a-kind pendulums and talismans are the key to conjuring your joy and unearthing your authentic self. Trust your instincts and connect with your inner wisdom through pendulums! Constructed with an amethyst focal, nickel textured crescent moons, purple flower jasper coin bead, silver plated chain, silver plated bead cap, and sterling silver wire. These are natural stones and hand-forged elements, small imperfections may exist. Each pendulum comes with a black velvet bag. It was a most wonderful experience working with Jessica on my custom order. She is very helpful and answers all question. She’s just very engaged in you and your order. My pendulum and pendulum box is so beautiful! One of a kind! Unique. She works her magic and makes the most beautiful magic tools! I can’t thank her enough. Take a look at all of her works they are so magical! Credit Cards, PayPal, Etsy Gift Cards. I take pride in every piece I create, so I stand behind my work 100%. If for any reason you are not satisfied with your order please contact me to arrange a refund*. I will refund your full purchase price, not including shipping fees, upon return of the item in its original condition, and within 30 days of delivery. All refunds will be issued via the original payment form. *custom order refunds will be granted on a case by case basis. I ship orders using USPS first class and/or priority mail which includes insurance and delivery confirmation on packages shipped within the USA. Orders greater than $100 will include signature confirmation. If you need quicker shipping, please contact me for shipping options and rates. Domestic shipping normally takes 3-5 working days. Please provide the address in English and the country destination language in the notes to seller for quicker processing. International packages are shipped using USPS first class international mail. All duties, fees, VAT's or other taxes are the sole responsibility of the buyer. It is the buyer's responsibility to know what is allowed to be shipped to your country. I fill out customs forms honestly and accurately, I will not mark shipments as gifts or declare a lesser merchandise value. International shipping takes approximately 3-5 weeks, although customs can occasionally delay packages further. Looking for something uniquely you? I love collaborating on custom creations. Please contact me for more details. I create my pendulums to be strong and durable. However, I am working with natural stones which can have hidden imperfections. These imperfections can result in chips or cracks, the focal is especially susceptible. So please treat your pendulum gently. My work is guaranteed for quality under normal wear and care conditions, in the unlikely event that your item breaks under normal conditions, just return it for a free repair. I will cover the cost of the repair along with return shipping to you. Should your piece break due to a traumatic experience, I will happily repair it for a nominal fee. Contact me via Etsy conversation for mailing address and repair details. All work here and elsewhere is protected under copyright of design, content and concept. Do you make custom pendulums? Yes, I do. Check my announcements above to see if I'm accepting new custom work. All my items come boxed and ready for gifting.